Thurles.info was created to provide a community news and information portal for the people of Thurles and the County of Tipperary. We wish to share with you, and the world in general, all the historical features and modern amenities of this beautiful part of Ireland. Please explore Thurles.Info and feel free to broadcast your views, comments and suggestions with us. We welcome any contributions which would balance and complement this website. Thurles (Irish: Dúrlas Éile) is a town on the river Suir in County Tipperary and is the largest town in North Tipperary. Thurles is surrounded by the Silvermines which are mountains to the north-west and the Slieveardagh Hills to the south-east. The town itself nestles in the heart of the beautiful Suir Valley. With a population of over 8000 people, Thurles gets its name from the Irish word Durles Eile Fhogartaigh meaning the strong fort of the O’Fogarty’s of Eile which formed part of the O’Fogarty stronghold, during the the twelfth century. The ancient territory of Éile obtained its name from pre-historic inhabitants called the Eli, about whom little is known beyond what may be gathered from legends and traditions. The extent of Éile varied throughout the centuries with the rise and fall of the tribes in occupation. Before the 5th century A.D. the details of its history which can be gleaned from surviving records and literature are exceedingly meagre, obscure and confusing. During this century however Éile appears to have reached its greatest extent, stretching from Croghan Bri Eli (Croghan Hill in Offaly) to just south of Cashel (in Corca Eathrach Eli). The southern part of this territory embraced the baronies of Eliogarty and Ikerrin, a great part of the modern barony of Middlethird, the territory of Ileagh, and portion of the present barony of Kilnamanagh Upper. The many castles and monastic settlements, which surround Thurles, bear lasting evidence to the area’s rich and colourful history. The town itself owes its development to the Norman Butlers and particularly to James Butler, who was created Earl of Ormond by Edward III in 1328. Two of the original family fortresses still remain in Thurles today. Modern day Thurles has grown from its early beginnings to a thriving hub of shop’s and businesses. It also has on offer a wide variety of facilities, including two historic museums St Mary’ Famine and War Museum and Lar na Pairce GAA Museum . Thurles is the birthplace of the Gaelic Athletic Association, founded in 1884 in Hayes’ Hotel. Local Semple Stadium is Ireland’s second largest sports arena with a capacity for 60,000 people, second only to Croke Park Stadium, Dublin. It is no wonder therefore that Thurles can offer a variety of sporting facilities including Gaelic games, Fishing, Horse & Greyhound Racing, Golf, Leisure Centres,and Equestrian Centres. St. Patricks College: This third level educational institution, is located in the centre of our picturesque town and has a history of religious and humanities education dating back to 1837. The college currently offers a range of courses from introductory to masters level in education, business, religion, theology, philosophy, pastoral care, and psychology. As well as offering a number of full time academic courses, St. Patrick’s College serves as a centre for theological, pastoral and spiritual renewal in the region. Tipperary Institute: Tipperary Institute is a dynamic higher education, development and research centre established by the Government of Ireland . Management of the Institute is the responsibility of the Chief Executive Officer, supported by the Senior Management Team. Tipperary Institute have two campus locations, Thurles in North Tipperary and Clonmel in South Tipperary. The work of TI is carried out by three specialist departments: ICT, Rural Development and Business Development. 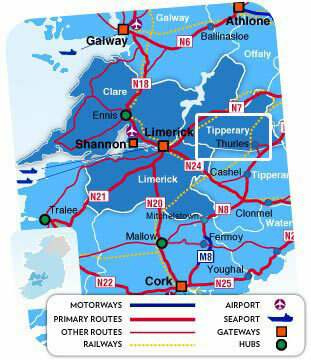 The closest major airport to Thurles is Waterford Airport . This airport has international and domestic flights from Waterford, Ireland and is about 73 km from the center of Thurles, Ireland.